Editor’s Note: Jay Palter covers a topic we discuss often here on The DigitalFA. Moreover, it is one that is nearly timeless as using LinkedIn effectively is at the crux of online and traditional networking. It is one social network very connected to conversations with business focus. While some who start reading will say “Hey, you covered this before! I don’t need help on LinkedIn”, pass it along to someone who can use it. We can attest to being asked regularly by very smart and successful financial professionals – how can I do better with online tools, networking and marketing. 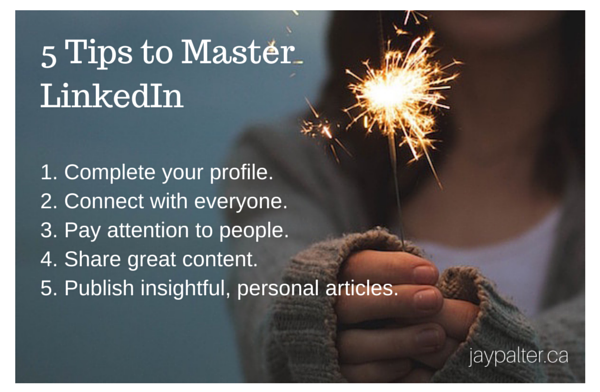 Master LinkedIn and you will have started toward developing some of the “art” of online interaction. in Jay’s words, it is first about the conversation, not the sale, when building your online presence. This article originally appeared on Jay’s blog on May 11, 2015. Most business professionals have figured out that a LinkedIn account is a required tool in the digital age. But far fewer people have a clear idea of what they should be doing with it. For me, it all comes down to this: LinkedIn is for good, old-fashioned networking. It’s for expanding your network and touching base with the people that are already part of it. It’s for helping people find solutions to their problems and to expand their networks. And it’s for nurturing relationships and getting to know people better. Beware of people that complicate LinkedIn in order to demonstrate their expertise or sell you something you really don’t need. If you’re in business and you’ve had any success, you know how to build a network. You know how to have business relationships. You know how to help people. LinkedIn is a tool for cultivating one of your most valuable assets in business: your social network. Write a summary in the first person that describes your essence and include the keywords for which you want to be found. Your profile is your calling card. People will search LinkedIn and you want them to find YOU. Tip: Invest in a warm and friendly headshot because people judge you based on appearances. If you meet anyone in real life and have a meaningful interaction of any kind, then add that person as a LinkedIn connection. You want to build a big network, an audience. Think of concentric circles expanding out from you. Tip: Always personalize your invitations to connect, mentioning something that ties you to that person. 3. Pay attention to your feed. At least once per day, you should look at your LinkedIn feed and like some posts, comment on others and share the best ones with your network. You get what you give. Tip: People pay more attention to people that pay attention to them. Sharing great articles, videos and graphics in your feed at least once each day (but preferably 2 or 3 times) is the best way to be visible in your network. You always want to be the bearer of helpful information. Tip: Go to LinkedIn > Interests > Pulse to find great content to share. 5. Write insightful and personal articles. Use LinkedIn’s publishing capabilities to write and share an article of your own at least once a month. You need to show people how you think, what you’re made of. Tip: Avoid marketing and self-promotional language and focus on sharing personal perspectives, insights and passions in a professionally appropriate way. Jay is a social business strategist and marketing expert specializing in social networking and personal branding for financial professionals and wealth management firms. His business experience spans two decades, during which he has held a variety of leadership positions in financial services, software development and marketing. Jay was formerly a life-licensed insurance professional in Ontario. Jay owns and operates an independent social media consulting practice and is a sought-after public speaker on social media strategies at financial industry conferences and events. He is a regularly published columnist in a variety of publications and is an active blogger, maintaining several of his own blogs available at jaypalter.ca and palter.ca.